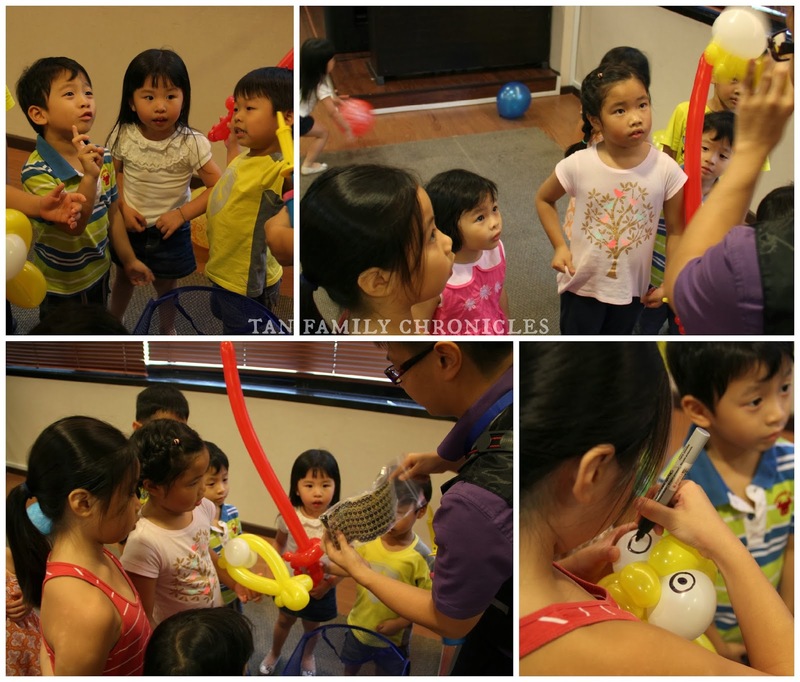 Tan Family Chronicles: The Twins' 4th Birthday Party! Remember, the twins just turned 4? Haha, the title of this blog post sounds like a bit of a misnomer since we have only ever thrown the twins two birthday parties – their 1 year old party, and this party for their 4th Birthday. Yes, we are the sort of parents who are in the camp that believe that it’s not much point throwing the kids birthday parties when they are so young, as they would probably not remember it anyway. Isaac himself only had birthday parties last year when he turned 6 – but yes, you read it right, he had ‘parties’ last year – 2 of them! We had just changed his school (childcare) three months before his birthday last year, and he took to the change very well, despite him being close to his old school friends and missing them. So when he requested to celebrate his birthday with both his old school friends as well as his new school friends, we agreed. We threw him a rock-climbing party for his old school friends on the weekend (which I have yet to blog about! urrghh) and we had a dinosaur themed party for him in school with his new friends. Thus, Asher and Shawna had an intimate taste of what a birthday party feels like last year. 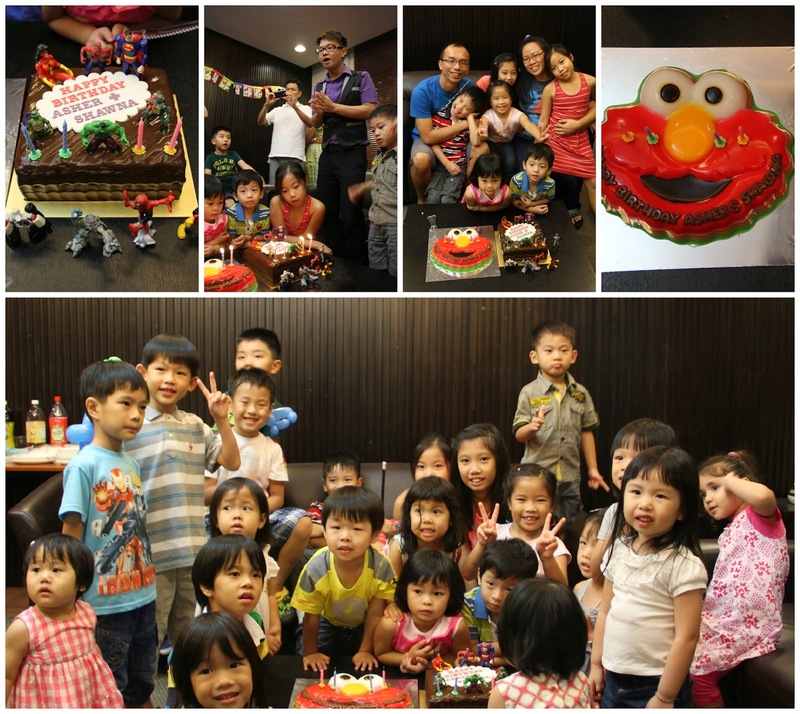 Approaching four years old, they are also more aware of things that happen around them and what it means to have playdates, as we have made an effort to keep in touch with the friends we had made at the previous school. As such, while it never crossed Isaac’s mind to ask for a birthday party when he turned 4, it is certainly on the top of the twins’ minds now, after experiencing their older brother’s parties last year. We were inclined to say no – to be fair, right? Since Isaac didn’t have a party at 4… But it is not easy saying no to two pairs of eyes looking pleadingly at you… so we escaped with a vague “We’d see how it goes.” to put them off for a while. So, just as I was wondering if it was possible to have a low cost party… Edwin of E MAGICAL MOMENT contacted us and offered to contribute his services for Asher & Shawna’s birthday party in January this year! 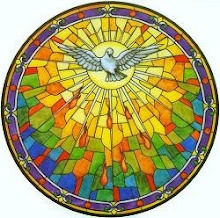 Wow, what a shower of blessings! It was providence! We’re definitely having a party for Asher & Shawna now! We decided to invite mainly the twins classmates as these were their closest friends whom they see almost 10 hours a day every weekday. Booking Edwin’s time was straightforward and quickly settled with a few smses. Other than that, we just had to book a function room, order the cakes, prepare the goodie bags, and make arrangements for my parents to take care of the kids on the actual day morning so that hubs and I could go get some finger food for the party. Edwin was very punctual, and went about setting up his stuff. Before he started, he actually came to check with me if there were any balloon shapes that I DIDN'T want him to twist. Befuddled for a moment, I quickly realised he was asking me if I was okay with him twisting the ever popular balloon sword and guns etc - which will inevitably erupt into balloon duels... For a moment, I was tempted to say that I didn't want all these balloon weapons being made, for we didn't exactly want to encourage violent play. 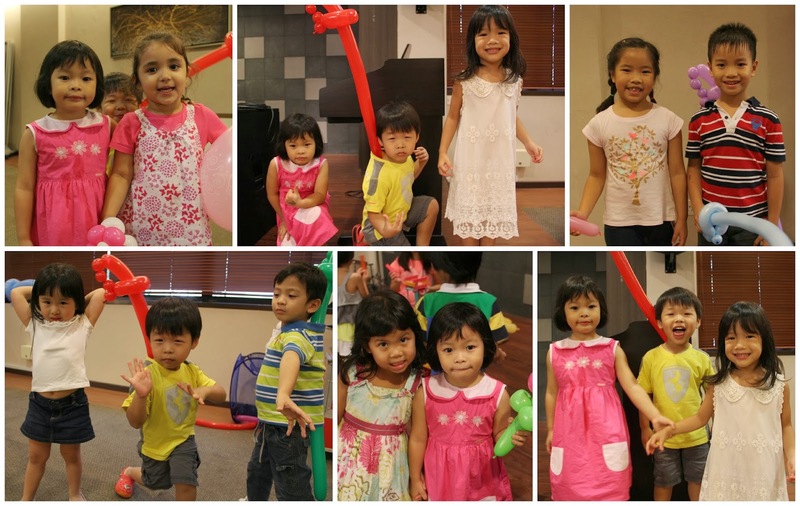 But I knew that the balloon sword was one the most popular and quickest balloons to twist, and the faster the balloon twister can twist a balloon, the more kids get their requests fulfilled. In the end, customer satisfaction won out, and I gave my verbal blanket agreement that there were no banned balloon shapes. What's a party without some action, eh? I liked it that he bothered to ask if I wanted to ban any balloon shapes though, that was quite thoughtful indeed. It was lucky the function room we booked was huge and had loads of space for the kids to run about. 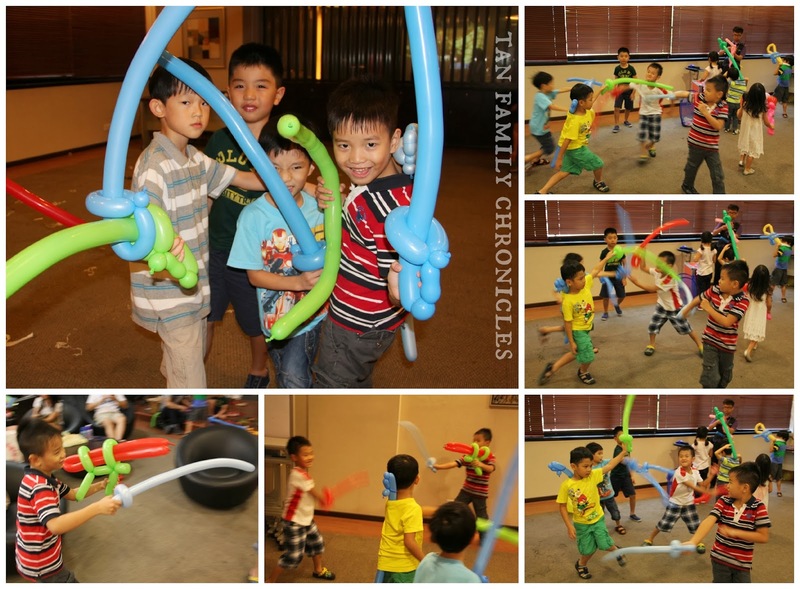 The venue quickly became a battlefield with balloon warriors dueling everywhere you could see. Asher, who has been enamoured with all things Ninja since he was very young, relish in his sword wielding, and promptly got engaged in a fierce battle with his cousin Dylan. The Amazing Ninja Asher, ferocious in a battle against Dynamic Dylan! And even though this was a party for the twins, Isaac had quite a few of his ex-classmates at the party too. That's because quite a number of the twins' classmates' older siblings, were in Isaac's K2 class last year. We invited two of Isaac's best friends, Isaac & Richard, along as well, to join in the fun. Thus it was a nice little reunion for the kids who had just attended their first few days in primary school. The parents all had a nice time trading first-week-in-primary-school stories as well. The boys (so happened none of the girls were there) didn't seem to bother with talking though. They were too busy dueling with one another, many holding two or more swords. Unsurprisingly, the boys broke out into a real fight in which Isaac had three swords, and was asked to give up one sword to a boy who had only one sword. Isaac chose to give his purple sword to his friend, but the boy did not want the purple sword but wanted the blue sword which Isaac didn't want to give up. I guess Isaac wasn't exactly in the wrong, since he did agree to give up one sword. But I was trying to convince him to be a "good host" and give up the blue sword. 6 year old couldn't care less about being a good host though, so I wasn't successful in my persuasion. The other boys started to take sides... and interestingly, the dueling stopped. "So what is more important, Isaac? 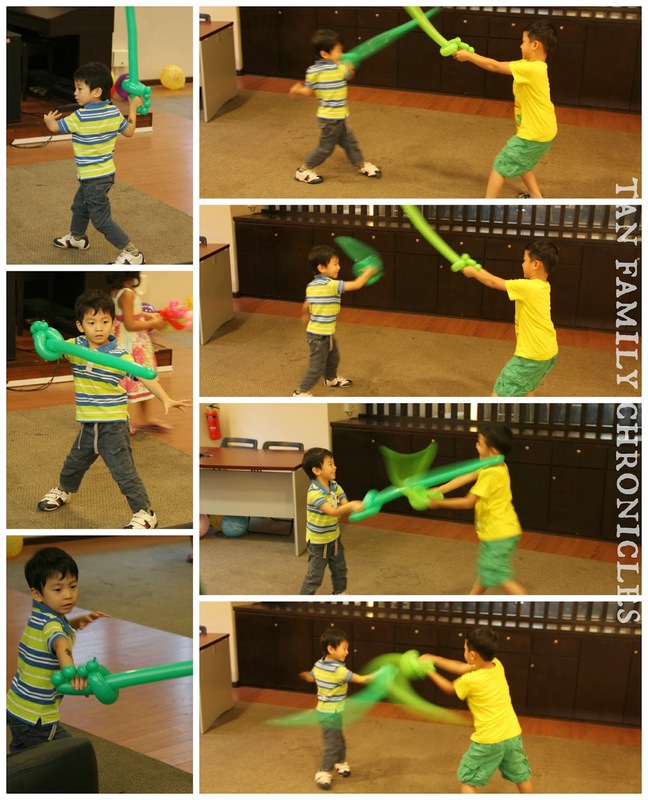 To have fun sword fighting like you guys were doing just now, or to quarrel over the colour of a balloon?" Nope, didn't work. Briefly, I wondered if I should have banned the creation of balloon swords. But I figured - Nah, if they didn't fight about this, it would have been something else. So what did the boys do after they stopped balloon fighting? They went to the CitiBlocs corner! I had set up a corner with 1,000 CitiBlocs, and the kids were having fun with the blocks. For most of the party, it was mainly the girls who were there building, since, I guess they were not interested in dueling. At the end of the big balloon argument, the boys all went to the CitiBlocs corner to start building. They were also physically tired out from more than an hour of continuous balloon dueling and running about. 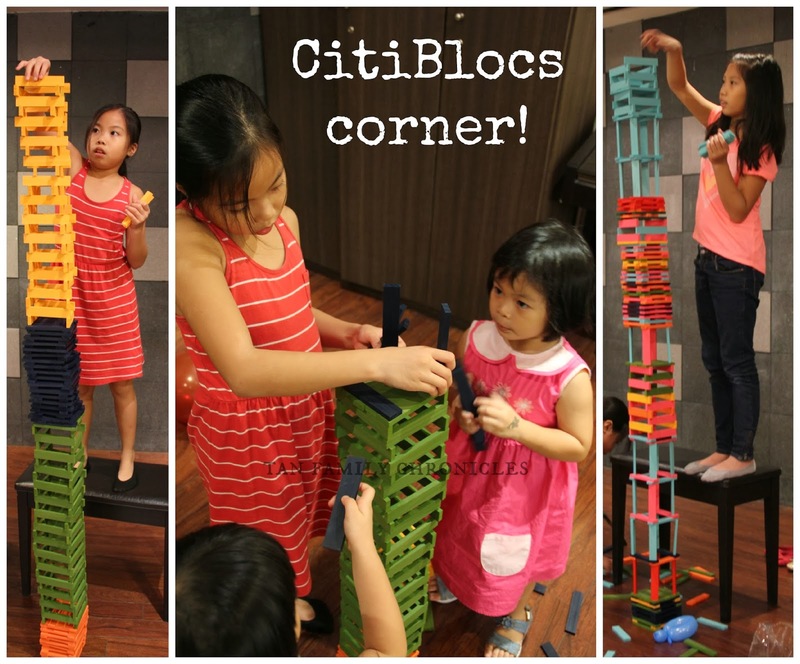 I was glad to have the CitiBlocs corner as it kept my nieces Rebecca and Isabelle entertained the entire party. Being the two oldest kids at the party, I was a bit worried they'd be bored with the "kiddy stuff" like the magic show and balloons. But thankfully, they were more than thrilled to see 1,000 blocks in eight colours - as they only have 400 blocks at home themselves. We scheduled the magic show to take place after the balloon twisting, so that people who turn up late can still catch the magic show. That turned out to be a very good idea, as quite a few families came a bit later - due to kids naps running over etc - which is really very common and not unexpected due to the age of the kids. Thus, thankfully, by the time we started the magic show, most people were here. In the few weeks leading up to the party, I suddenly grew a bit nervous about having agreed to have Edwin of E Magical Moment come be our main act of the party. What if he was very irritating, or like, weird or something? I mean, you usually engage a magician if you have seen him in action before and you like his act, right? But here, given our unique circumstances, I haven't seen Edwin's act before, and suddenly I was having the jitters about him. I started praying "Please let this Edwin guy be good, and not irritating!" 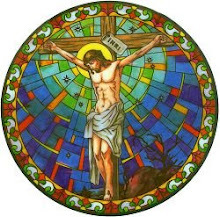 for I have seen a number of irritating and annoying entertainers before and it was something I really couldn't stand. Thankfully, my fears were unfounded. Edwin is a very nice guy, with a kind of studious look that enables him to tell jokes with a straight face. He's also good with the kids, which is great. 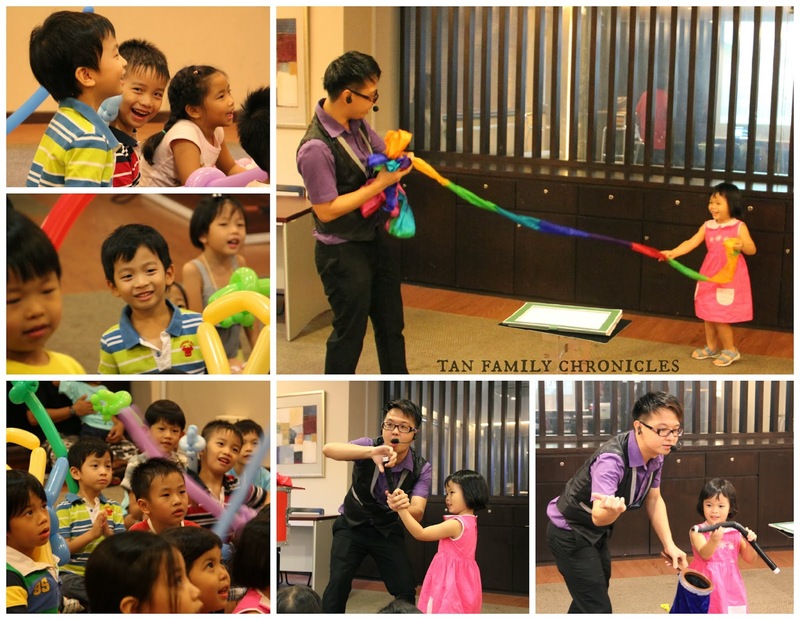 He was able to capture all the kids attention during the entire duration of the magic show. And he could get Shawna to cooperate with him to get some tricks done with her help. All too soon, the magic show came to an end. The kids were disappointed and wanted it to go on for much longer. But they were quickly distracted with the shouts of "Birthday cake! Birthday cake!" and the kids quickly gathered around the birthday cakes. Edwin even conducted the cake cutting for us. Months earlier, Shawna had requested for a "jelly cake" which I thought was a good idea, since having two birthday cakes could be a bit much. Having a jelly cake would add some variety to the menu. I asked around for recommendations and settled on getting from Food Mapping as they were conveniently located at Beauty World, and also because I was recommended them by more than one person, so the standard must be "quite there", I thought. The 2kg rich dark chocolate fudge cake is from a brand new bakery by the name of Cake Crafters which we have had the good fortune to taste before. So we knew it would be a delicious chocolate cake to have. It's something like a Lana Cake, only this one is even richer and far yummier! The only problem was that they didn't have nice fancy cartoon art on the cake. But no matter! We had loads of the kids favourite action figures at home that we could scrub clean and use as cake toppers. And it turned out perfect! The cakes were definitely a sweet and perfect way to end a simple party. There was hardly any cake left for us to bring home, that's how good they were! :) Thanks everyone for coming to the twins party! 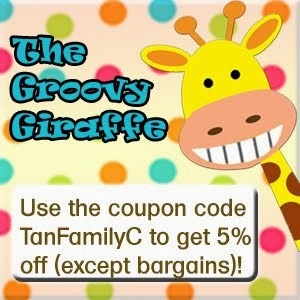 And now, for a sweet way to end this blog post, we've a special discount code for you! 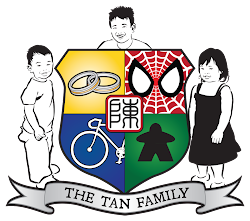 Quote "Tan Family Chronicles" when you book any package off E Magical Moment and get 10% off! Start planning your parties now! Cake Crafters - fabulously rich 3 layered chocolate fudge cake. This is the one we're ordering from for the rest of our lives when we want chocolate cake! Remember to book at least 3 days in advance!